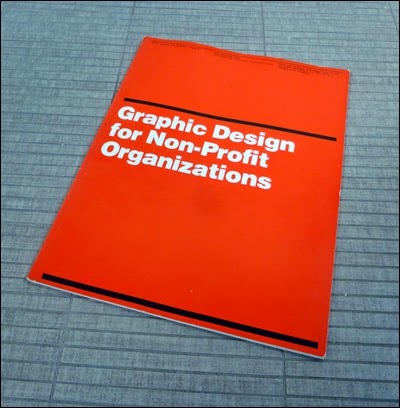 During December, 2012, I discovered the book “Graphic Design for Non-Profit Organizations” (1980) by Peter Laundy and Massimo Vignelli. Here, one of its co-authors and designers, Peter Laundy, shares his experience of working on this project with a pioneering designer. How did you get to work with Massimo Vignelli on this project? This, I believe, was my first project as a designer at Vignelli’s office (410 East 62nd Street, sharing a floor with the architecture office of Edward Larabee Barnes). I was on staff from 1978–86. We found each other through an unlikely turn of events, not the normal portfolio review. I had been asked by Aaron Marcus, a former professor of mine at Princeton, who was on sabbatical abroad, to hang the show of his transit map collection at the AIGA. After hanging it, I arrived at the opening to find what I had done rearranged, with the prime wall real estate going to a side-by-side comparison of the Vignelli-designed New York subway map and the new, more realistic map done by John Tauranac, of the Metropolitan Transportation Authority (MTA), that would soon replace Massimo’s throughout the system. Out of this event, the idea of the “Great” Subway Map Debate in the Great Hall at Cooper Union was hatched, and I found myself a member of the pro-Vignelli map debate team. Subsequently, I arranged to meet Massimo, and walked out of the meeting with a job offer. I may have brought my portfolio, but remember leaving stunned that I had been hired without showing him my work. You were responsible for “Design and text” that I perceive to mean you were also the copywriter. If so, can you describe your writing process? This involved both the copy for the book and the conception of it, including image-sourcing and copywriting for all the university and historical society examples, which were all hypothetical. This was pre-internet, so sourcing of images was less streamlined, and as I remember, there was no budget for image purchases or typesetting. I’d say over 90% of my time involved creating the case-study examples. Concerning the “writing process,” after 36 years, my memory is a little fuzzy on the details. Workflow would best be answered by expanding beyond the writing of the book. I think page count was first established, then content and rough layout, then basic guidelines, then examples. And finally, book text to fit the spaces allotted. Massimo trusted me with the writing, and I imagine Mark Wieboldt, who handled the book’s production, gave me more feedback on it than Massimo did. How did you work with Vignelli? Regarding the inverse, how did Vignelli work with you? As this was my first project, coming from outside the Vignelli orbit (my education at Yale was very Basel-influenced, and I didn’t run across his work at my two previous employers: George Nelson and Anspach Grossman Portugal), I imagine Massimo set out the basic parameters at the beginning, with the content structure more or less established, including starting with the basics and applying them to two theoretical non-profit clients to-be-determined. I then periodically checked in with him more at the beginning than when we went along, because he was satisfied with how I was filling in the blanks. In general, most of the design staff worked pretty independently of Massimo, as the approach and guidelines were clear, and those we hired had layout and typographic training. When Massimo did get involved, it was mostly at the beginning, with reduced scale pencil sketch mock-ups. I remember making a lot of roughly 3” x 4” bound sketches for 8-1/2” x 11” final material. from your working with Vignelli? Memorable moments? The whole team’s trip (with spouses) to the Aspen Conference on Italian Design. Listening to industrial designer Jay Doblin and Massimo reminisce about their days at international design firm Unimark in Chicago. Being on an Eastern airlines plane that had to land on its belly, with wheels up, returning from IBM Boca Raton and the launch of the IBM Personal Computer (IBM PC)—we had a hand in aspects of its launch. Working on a picture book for Champion Paper on the subject of time. Lessons learned? There were so many. Concerning design, Massimo’s approach to working with a grid was inspired, though now harder to achieve on the Web and somewhat out of style. He believed that the grid was there to provide the structure, and the designer was there, not to maximize the structure or perceived discipline, but to energize spreads, individually, and especially in sequence through varying, scale, contrast, layout, color, white space and content. He depended on the grid to supply the requisite discipline, and tried to make each spread, or set of a few spreads, into a coherent and unique whole, rather than a chunk of content with arbitrary starting and finishing points, like in an eBook. Today, with online sequences no longer linear, and with windows full of responsive flexibly-scaled content to accommodate a variety of window sizes and proportions, it is difficult to use two of the tools that made Massimo’s books sing: fixed page sizes and fixed spread sequences. Also, it is surprising to me, and I suspect to Massimo, that in a medium where space is infinite and dirt cheap, that space feels more stuffed full of content then it did when space was limited, and paper and ink a real cost, and the communication a nuisance to store. It is good to see this changing. This approach to the grid, in which structure were in creative tension with variety and vivacity, integrated nicely with his perspective on identity. He believed in actively considering what elements should be consistent to deliver the identity, and which can vary, so as to not always default to the same set of identity elements (e.g. logo/symbol, typeface, colors, grid). He had lots to teach concerning design ideas. I think he’d agree with graphic designer and illustrator Bob Gill’s assertion that a design idea is something you could communicate over the phone. Then, with the idea in hand, you would be energized to set about doing the detailing necessary to execute it well. He looked for opportunities to provide unexpected joy along with inspired practicality. For example, when approaching the problem of designing a logo-emblazoned folding shopping bag, he realized that if he hid the logo in the gussets (the two folding sides of the bag) the two logos would only be revealed when the bag was shaken open (providing an unexpected pleasurable moment), and that when you are walking down the street with bag in hand, people approaching you or following you on the street, or hallway, can see a logo (providing inspired practicality) because it is directly facing them. The Vignellis looked for opportunities to collaborate with artists, and use the art as part of a design solution, but they never thought what they did was art, as their goal was to create items of not only cultural intelligence and aesthetic refinement, but also of pragmatic utility. What was the timeline for completing the project? I think it had been sitting on the shelf, needing a staffer to work on it, when I arrived—so there was some urgency. I believe I worked full-time on it for about 4 months? Did you proof and approve the printing? I don’t remember being on press and that we may handed this off to the AIGA for printing. How many copies were made? And who received them? I think the first print run was in the vicinity of 5,000, but I wouldn’t swear to it, and I don’t know if the AIGA ever felt compelled to reprint it. It was provided to non-profits for free, so I suspect everything was covered by a grant, perhaps from the National Endowment of the Arts (which may have also gotten copies), and once it ran out, there was no financial impetus to reprint. I believe the bulk went to the AIGA, which at that point was the national organization: chapters were not yet in existence. Carolyn Hightower was the Director at the AIGA at that time. Made available in 1980, the guide “Graphic Design for Non-Profit Organizations” is receiving attention in our digital society. It reinforces the importance of enduring forces, such as books, visual branding, the typographic grid, and non-profits. What is your take on the publication’s relevance then and now? The guide was free, and we weren’t privy to whom it was distributed, so we had no window into its relevance to users. I suspect it improved the communication quality at some non-profits. 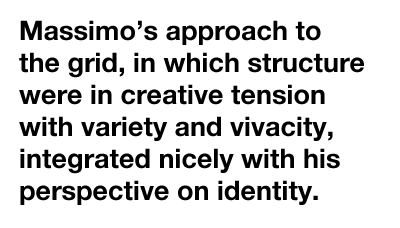 It certainly was thought of, by Massimo, as communicating an enduring point of view about visual identity and publication layout. And I can see from today’s perspective, which is quite modernist and minimal, now that flat is in, and sculptured and skeuomorphic are out, that the guide’s point of view appears enduring. However, viewpoints do change, and they did change dramatically for the period soon after the guide was published. In the 1980s, a large number of designers, tired of modernism as it was then practiced, began rebelling against its underlying assumptions and rules. They felt the lessons of modernism had been learned and its formulas fully explored, and were invigorated by challenging modernist orthodoxy. During that period, I was surprised and flattered to find, in a talk I attended, that a quite successful and respected design colleague singled out the guide, criticizing it from what at that time was called a “postmodern” perspective. Now that the modernist perspective has returned with vigor, it appears today that this movement of postmodernism might have been better dubbed “a brief holiday from modernism,” though who knows what the future will bring. Personally, I thought the guide had a sensible objective: To bring more structure and professionalism to non-profit communications. Its intended audience consisted of smaller organizations who could not afford card-carrying graphic designers, and instead, tasked non-designers with making communications. Perhaps it is worth pointing out that at this time in history, before page-layout software, the grid was something only trained graphic designers knew about, the number of graphic designers in the world was vanishingly small, and expense was SO much higher than it is now for design labor, typesetting and printing. Only with the advent of desktop publishing have typefaces, templates, and to some extent, grids, become broadly learned. (1) The Hauserman showroom can be found in “Design:Vignelli”, pages 204–207. Photographs courtesy of Peter Laundy. Sean Wolcott, of Rationale Creative, was permitted by Massimo Vignelli to distribute a high-resolution PDF of “Graphic Design for Non-Profit Organizations” for downloading. Typeface of quotations is Helvetica, originally designed by Max Miedinger with Eduard Hoffmann in 1957. Massimo Vignelli participated in the Gary Hustwit’s documentary film “Helvetica” (2007). An update was posted by The Vignelli Team on May 11, 2014. Mr. Vignelli passed away on May 27, 2014.